What light do I set up first? So when you are thinking how you will light a photo or video, imagine you are painting a picture with your lights as your bushes to achieve the mood you want. 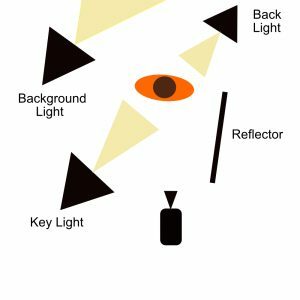 The key light should be your first light you set and you need to choose whether you want to use a hard or soft light source. A hard light is from a single point light source. This creates sharp, distinct shadows and edges. A soft light is created from a broad light source. This creates soft shadows and edges, with the light rolling off of the subject. You may want to use hard lighting creates stark shadows for a more moody or gritty appearance. Soft lighting is more forgiving and neutral in tone, with softer shadows that are better for emphasising beauty. Once you are happy with the effect you are getting from your Key light, move on to setting you fill and backlights. Here you can see a Typical 3 light interview setup. In my opinion to get the best result always set your Key light up on the far side of the interviewer (from the camera). 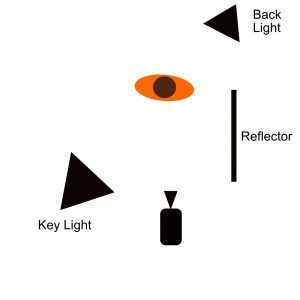 A good starting point for the light is so the light above eye height and about 45 degrees. I always use a soft light for my key, but this is personal preference. When setting the Backlight a good place to start is setting it up so it is just out of shot behind the talent. The Backlight can be set up high or even down to shoulder or chest height of the talent. A backlight works best when it is on the opposite side to the key light. My go-to advice is keep the light above the talents head unless they are bald. Another import factor to setting the Backlight is to make sure it only lights the back of the talent or subject. A badly place Backlight can shine on the tip of the talents nose creating a hot spot that looks bad. Setting the fill light is the easiest of all. It literally is only there to lighten shadows so depending on what shadows you want to lighten will determine its position, but a safe place to start is as shown above. One import thing about fill lights is to make sure they are not too bright (otherwise they become the key light). Shadows are good and create mood so don’t try to get rid of them completely. If you only have two lights you can setup as above. 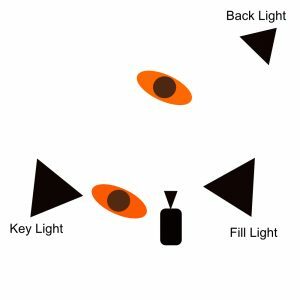 In this two light video setup you are using a Key light and a Backlight. The fill light is supplied by a reflector this can be anything that is white (or silver). A really easy, cheap and good option is to use foam core board, but if you want something that will work for you for years to come try a fold out reflector like this or like this. There will be many situations where you will need to light the talent as well as the background. Don’t worry you can achieve this with a 3 light kit as shown above. 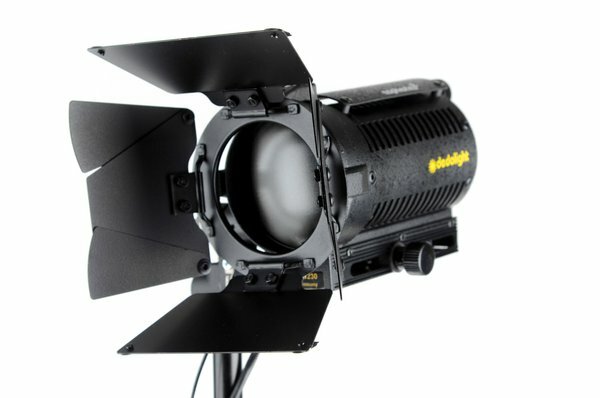 However please note with more lights in your kit will give you more options in your lighting of any scene or photo. Remember lighting for video or any images is a very personal thing. Some types of lighting that I like may not be what you like. There is no correct one way to light, but for most shoots you will want to make the talen look as good as they can and the 3 setups above will help you achieve that. What lights do I use for an Interview? I own a range of lights but I have a two types of light fixtures that get a lot more use than the rest of my lights put together, Lowel Tota-light’s and Dedolight DLH4’s. I have 4 Lowel Tota lights and 7 Dedolight DLH4 lights as part of my kit. Typically I use the Tota’s with Umbrellas or soft boxes to produce beautiful soft flattering light for both my Key and Fill. I then will use a Dedo for a Backlight. Then to add more visual interest to the shot and background I will use a few Dedos to add accents to areas of the frame. Do remember that shadow is necessary in any shot other wise your images will be flat and lack the ability to draw the viewer’s eye to different areas. When lighting the easiest way to see what each light is doing is to turn the others off and only have one light on at a time. That way you can see exactly what the light is hitting and affecting, then you can move, diffuse, colour, strengthen or dim the light until it is doing what you want. Have fun experimenting with your lights!